Fishing has been excellent on fly in the lakes and rivers. Bait fishing in the lakes has been good and trollers are picking up some nice ones too. 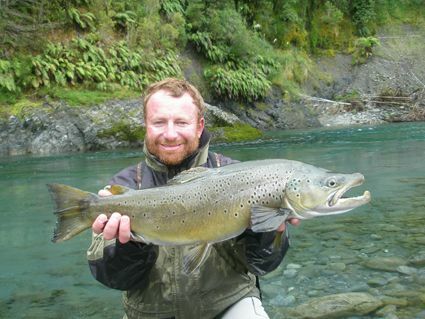 Local angler and report regular Stuart Sturgeon gave the local rainbows a break and hit up some of the NZ browns recently. Below is Stuart's personal best trout on fly and was one of several crackers caught. The fish weighed in at 3.8kg and was released. Rivers:- Have fired well with good levels, good temps and feeding fish. The Thredbo has been very good and the Eucumbene has fished well. There has been quantities of food around and the fish have been up and feeding regularly. 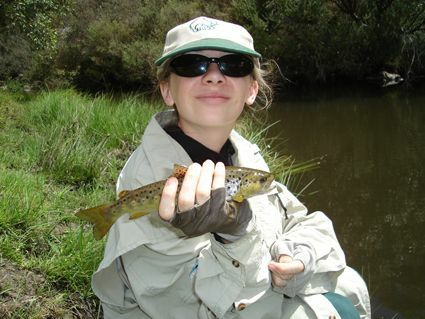 *Twelve year old Jenna from Singleton Fly Fishing Club has already caught a number of fish on fly and was able to add to the list recently with this her ever first trout on fly. A very pretty brown caught in the Mowamba on a parachute brown. 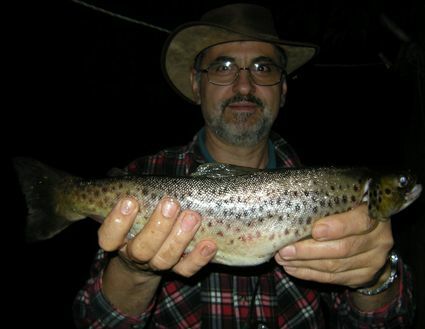 *Russel Rose from Canberra caught a number of nice browns in the Eucumbene over the weekend. Hopper patterns were the best flies. 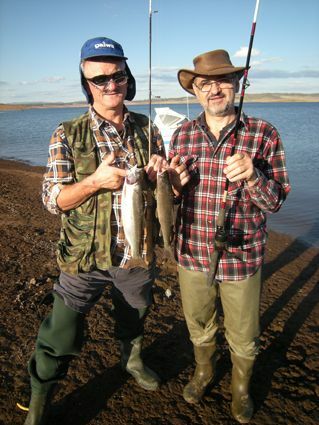 Lake Eucumbene:- Fly reports have spiked with some great rainbows about with many fish in excellent condition. Despite dropping water levels the bank fishing has been good. Stick caddis are in numbers as are mudeyes with only good or bad weather determining how good the fishing is on the day. *Russell Rose fished the lake landing seven nice fish on his mudeye pattern, all rainbows. Beetles and mudeyes were the stomach contents of a couple of the fish kept. *John Herzog reports that he and Mick Hazalias had a great couple of days catching fifty odd rainbows between them. Thirty of these were in the one morning session. Mudeye hatches have been a bit quiet this week but should improve with the moon. The fish are still eating them and their imitations so searching in the evening with these pattern is a good option. Tom Jones and Scruffies have also worked well this week. Eucumbene:- Eucumbene trolling reports have been better with some nice fish in the Buckenderra arm. Flat lined tassies in white and yellow or white have been working well. Cowbells with mudeyes have turned up a few fish too. *Team Palmano have been at it again in Eucumbene with a great session of sixteen fish between four anglers. Mudeyes and flies cast with a bubble float were best. John Palmano and Theo Skordilis with a couple of the first fish. Theo with a nice brown.